HMS York’s hulk in Suda Bay being inspected by Italian naval personnel after the British evacuation from Crete. The capture of the ship’s logbooks ended Luftwaffe claims that it had sunk York. A popular impression in the United States of the Regia Marina, the Italian Navy, during World War II is that because its powerful surface fleet spent so much time in port, it was more effective as a fleet in being – in other words, for what it could do – than for what it actually did. As with all generalities, there are exceptions, and in this case that exception was its Decima Flottiglia MAS (10th Light Flotilla), one of the most effective units in the history of special operations. Decima MAS, as it is usually called, was composed of highly trained Italian frogmen capable of conducting long range surface or underwater operations using modified MTM (Motoscafo da Turismo Modificato) light motor torpedo boats (nicknamed barchini – “little boats”), midget submarines, and manned torpedoes to attack and sink targets. During the Battle of the Mediterranean (June 1940-July 1943), Decima MAS participated in a dozen operations and sank or heavily damaged five major warships and 20 merchant ships totaling 130,000 tons. One such successful raid was the attack on the British heavy cruiser HMS York in Suda Bay, Crete, on the pre-dawn morning of March 26, 1941. An attack was quickly planned, using six MTMs dispatched from the destroyers Francesco Crispi and Quintino Sella, which were specially modified to transport them. Packed with 660 pounds of explosives in their bows and with a top speed of 34 knots, the MTMs were high-speed motorized bombs. Located south of Greece, Crete was being used by the British forces in Egypt as a forward operating base as part of its campaign to support the Greek army against Italian army invasion in early spring 1941. British fleet operations were staged in Suda Bay, a long, deep natural harbor on the island’s northwest coast. In mid-March, Italian aerial reconnaissance had observed a heavy concentration of ships in the harbor. In addition to the York, the light cruiser Coventry, destroyer Hasty, and fourteen support ships and tankers, including the 18,000-ton tanker Pericles, were in the harbor. 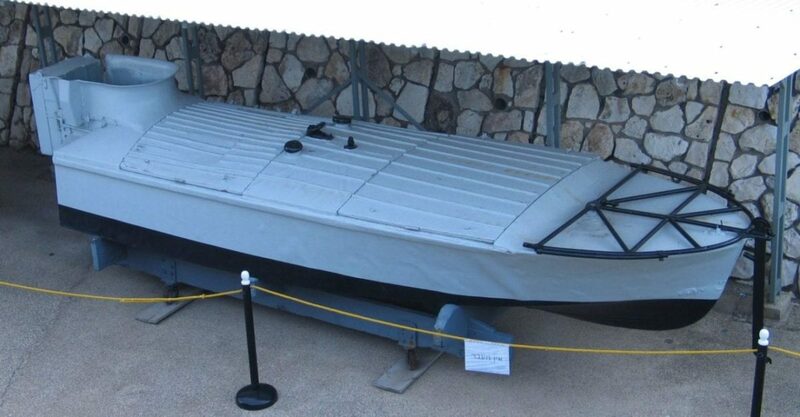 An Italian MTM at the Clandestine Immigration and Naval Museum, Haifa, Israel. Note the net cutter at the bow and the device aft of the cockpit, which unfolded as an integral life raft and was jettisoned once the boat was set on course for its target. Photo by Bukvoed via Wikimedia Commons. An attack was quickly planned, using six MTMs dispatched from the destroyers Francesco Crispi and Quintino Sella, which were specially modified to transport them. Packed with 660 pounds of explosives in their bows and with a top speed of 34 knots, the MTMs were high-speed motorized bombs. Because of the high risk involved, such missions were considered one-way efforts. But, unlike the later Japanese kamikaze aircraft, the MTMs were not suicide weapons. Once the operator, piloting the boat from the stern, got within striking distance of his target, he would leap out of the boat and float away on a life raft designed to protect him from the shock of the explosion, and from which presumably he would be captured. The attack was a spectacular success. The York was hit amidships. Both engine rooms were flooded, leaving the ship without power. The cruiser was quickly taken under tow by a tug and the Hasty and beached. The Pericles was sunk, though because it settled in shallow water, most of its fuel cargo was able to be unloaded. The night of March 26 had no moon and calm seas. In less than a minute after getting into position ten miles northwest of the entrance to Souda Bay at 3:30 a.m. the destroyers launched the six MTMs under the command of Lt. Luigi Faggioni. Faggioni and his boats had less than two hours to reach the bay and find his targets, as sunrise would occur at 5:18 a.m. The harbor was protected by three boom and net barriers, with one at the mouth of the bay, and the second about a half-mile beyond, near the forts that guarded the entrance. The third barrier was near the base of the bay, protecting the anchored ships. Taking advantage of the heavy haze protecting the MTMs from shore observation, Faggioni’s boats, designed to run over such obstacles as protective booms, easily crossed the barriers. Shortly after the six MTMs crossed the third, and last, barrier they separated and sought out their assigned targets. Two attacked the York, located closest to the third barrier. At 4:46 a.m., the silence in the bay was shattered by a series of deafening explosions. Thinking that it was an aerial attack, the anti-aircraft batteries began firing blindly into the night sky. The attack was a spectacular success. The York was hit amidships. Both engine rooms were flooded, leaving the ship without power. The cruiser was quickly taken under tow by a tug and the Hasty and beached. The Pericles was sunk, though because it settled in shallow water, most of its fuel cargo was able to be unloaded. Two other cargo ships were damaged. Only one of the MTMs failed to hit its target. It was later found on a nearby beach. Initially the Luftwaffe insisted it had sunk the York. After abandoning hopes of salvaging the cruiser, the Royal Navy scuttled York as the British evacuated Crete. Italian navy officers later boarded the hulk, recovered the York’s log, and put an end to the Luftwaffe’s claims. Faggioni and his men, Sub. Lt. Angelo Cabrini, Petty Officers Alessio de Vito, Tullio Tedeschi, Lino Beccati, and Sgt. Emilio Barberi, were all captured. Eventually they would receive Italy’s Medaglia d’Oro, the equivalent of the Medal of Honor.